Belasco, W.J. (2018). Fast food. In S. Bronner (Ed. ), Encyclopedia of American studies. [Online]. Johns Hopkins University Press. Available from: https://search.credoreference.com/content/topic/fast_food [Accessed 25 April 2019]. Belasco, Warren J. "Fast Food." Encyclopedia of American Studies, edited by Simon Bronner, Johns Hopkins University Press, 1st edition, 2018. Credo Reference, https://search.credoreference.com/content/topic/fast_food. Accessed 25 Apr. 2019. Food that can be served up fast, since it requires little preparation. Most types of cooked Junk food are available at fast food outlets. “Tell me what you eat and I will tell you what you are.” So said French gastronome Anthelme Brillat-Savarin (1755–1826), who, when visiting the new American republic during the 1790s, was impressed by the wild turkey, an undomesticated animal that ably symbolized an as-yet-untamed frontier society. But if one defines a people by what they eat most often, the real American cuisine today would have to be fast food. Indeed, a poll in the mid-1980s selected hamburgers over apple pie as “the American official food.” Fast food now pervades every aspect of American life. It dominates the landscape, expands the waistline, employs many teenagers at the start of their working careers, and serves as a primary wedge for the export of American culture. And if fast food is defined as any meal that saves time and labor, then most of the products sold in supermarkets and convenience stores might also be considered fast food. To make a profit selling mass-marketed food that is at once quick and easy, tasty and (at least in part) wholesome, fun and safe, operators tend to rely on what might be called the “eight Fs” of fast food: family, fast, fried, filling, fresh, fantasy, Fordism, and franchising. Family: Because busy Americans cook at home less, they look for places that can substitute for the family dining room. Food must not be too spicy for children, not too expensive for middle-class budgets. Restrooms must be clean and accessible, the dining area generally bright and airy—like a suburban eat-in kitchen. Plastic tables ease cleaning up after restless children, who may sometimes be directed to special play areas. Food is generally served by women—surrogate moms or big sisters. In line with middle-class notions of propriety, “family restaurants” rarely serve liquor and never have separate bars. Fast: Fast-food restaurants originated in the 1920s serving hurried auto-tourists who did not want to waste time off the road; modern suburbanites, too, want to get in and out quickly. Large signs and well-marked driveways make it easy for speeding motorists to get off the road safely. Food must be prepared and served quickly. To save time, customers may help themselves at counters where multiple checkouts reduce waiting time. A fast-food restaurant is no place for a leisurely conversation; even the faintly audible, ever upbeat background music tends to hurry one along. Fried: Americans love crispy, fried food, yet they are often afraid to fry at home owing to the vast amount of oil needed and the resultant odors; to avoid this unpleasantness, they indulge at restaurants. Also, in line with the speed requirements, fried dishes can be prepared quickly and are easily carried out and eaten with fingers while driving. Frying also compensates for what might be termed the taste deficit inherent in many highly processed convenience foods. Filling: Mass-marketed meals must be able to convey a good “perception of value”; they must be filling yet also seem economical, “a good deal.” While all cuisines rely on grains to anchor the meal, in America wheat is the filler of choice. To be both cheap and filling, dishes tend to have a lot of bread (as in the rolls) and breading (as in fried chicken). It is also easy to fill up cheaply on fried potatoes and, in a recent concession to health concerns, at salad bars. Fresh: Every cuisine has ways to certify that food is safe to eat, that it is not spoiled. For safety Americans look for certain bright colors, for example, very green beans, very red tomatoes, very yellow pineapples, and so on. Crispness, too, has meaning: fries must be firm, not mushy; lettuce brisk, not wilted. For Americans temperature has hygienic meaning: to be fresh food must be either very hot (as in fries) or very cold (as in drinks and lettuce). Tepidness is usually suspect. Energy-intensive refrigeration and air conditioning are mandatory. A sanitary atmosphere counts as well. 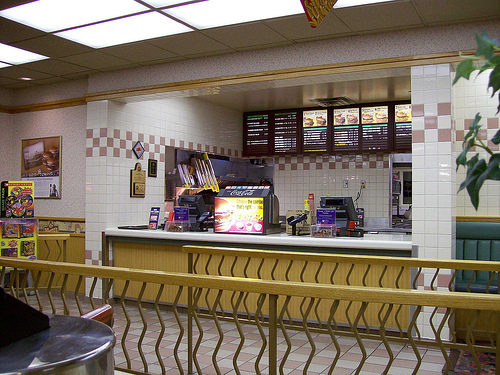 With their shiny aluminum, tile, and plastic, fast-food restaurants try to look scrupulously clean. Kitchens are usually visible from the dining area. Strong fans eliminate objectionable frying smells. Floors and tables are scrubbed continuously. Fantasy: Although the family restaurant must feel like a home-away-from-home, the fast-food experience is also a form of tourism, promising escape, adventure, excitement, “a break.” Reflecting their ambivalence about modern urban life, Americans like nostalgic themes, especially the old West, Victorian, New England, and Spanish colonial, and numerous varieties of neoethnic, especially Italian, Chinese, and Mexican. Suggesting a mythic world, fast-food architecture and design approximate that of the Disney theme parks. Fordism: In its production fast food follows the lead of Henry Ford (1863–1947), whose assembly lines manufactured cars swiftly and cheaply for the masses. Fordism is defined as a carefully organized division of labor to reduce costs and time and a preference for automated equipment over skilled labor. Fast-food workers tend to be young, unskilled, and low paid. They are as interchangeable as the product they sell. Believing with Ford that mass production worked best if the product options were few, successful fast-food operators hesitate to introduce new products, following McDonald's founder Ray Kroc's advice to “keep it simple, stupid” (KISS). In recent years, however, the chains have begun to group themselves in food courts to meet Americans' diverse and fickle tastes. 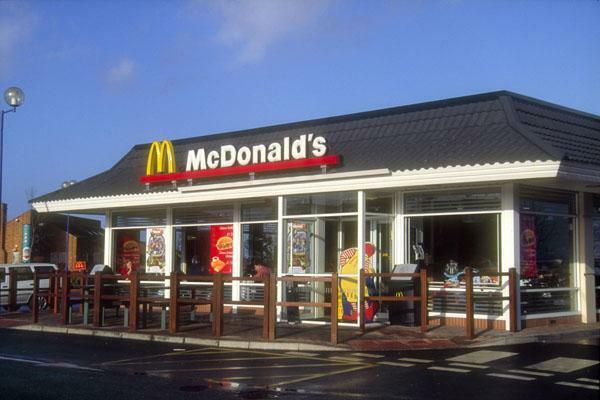 Franchising: Through franchising, fast-food companies may expand rapidly. Most outlets are locally or regionally owned. In return for a franchise fee, the local owner is licensed to sell a certain brand and also receives management and advertising support from the central company. In effect the local owner (franchisee) supplies the capital for expansion, while the main corporation supplies the concept, aura, and ingredients. Through this unique hybrid of small and big business methods, fast food has spread across the continent—and around the globe. While fast-food marketers focus on fulfilling the “eight Fs,” citizens would do well to consider a ninth, Future: Where to now? Clearly, as long as people want and can afford convenience, fast-food companies will seek to expand and profit. But can the earth sustain a feeding system that is so thoroughly wasteful of resources, especially energy, water, and soil? While the affluent fifth of the world gorge on excess calories, the poorest fifth of the world's population is malnourished. Ultimately, the fate of the fast-food industry may be determined by considerations of global equity and carrying capacity, not consumer convenience. 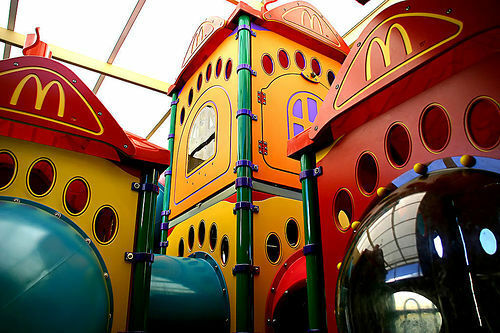 McDonald's. Ian Britton, photographer. FreeFoto.com. Coe, Andrew Chop Suey: A Cultural History of Chinese Food in the United States (Oxford 2009). Critser, Greg, Fat Land: How Americans Became the Fattest People in the World (Houghton Mifflin 2003). Gutman, Richard, American Diner: Then and Now (Harper 1993). Hirshorn, Paul; Steven Izenour, White Towers (MIT Press 1979). Jakle, John A.; Keith A. Sculle, Fast Food: Roadside Restaurants in the Automobile Age (Johns Hopkins Univ. Press 2002). Langdon, Phil, Orange Roofs, Golden Arches: The Architecture of American Chain Restaurants (Knopf 1986). Leibs, Chester, Main Street to Miracle Mile: American Roadside Architecture (Johns Hopkins Univ. Press 1995). Leidner, Robin, Fast Food, Fast Talk: Service Work and the Routinization of Everyday Life (Univ. of Calif. Press 1993). Mullins, Paul R. Glazed America: A History of the Doughnut (Univ. Press of Fla. 2008). Rappoport, Leon, How We Eat: Appetite, Culture, and the Psychology of Food (ECW Press 2003). Schlosser, Eric; Charles Wilson, Chew On This: Everything You Don't Want to Know About Fast Food (Houghton Mifflin 2006). Schlosser, Eric, Fast Food Nation: The Dark Side of the American Meal (Houghton Mifflin 2001). Spurlock, Morgan, Don't Eat This Book: Fast Food and the Supersizing of America (Berkley Trade 2006). In the broadest sense, a mixture of lipids – chiefly triglycerides (lipids containing three fatty acid molecules linked to a molecule of glycerol).